The act of reading palms has been prominent throughout history. It is thought to allow people to discover their destinies, but what people don't know is that feet also have a similar role. The shape of your feet can actually be used to reveal interesting things about your personality. Below are 10 different foot types, all with their own unique attributes. Unlike those who can't separate their little toe, these people show a need for change in their lives. Routine and structure makes them unhappy, leading to them being very adventurous. These people are also easily bored, so they can sometimes liven up the mood by doing something drastic. These people know how to separate their emotions from day-to-day life. As a result, anything that requires them to be emotionally detached is a simple task. Little toe on the side of the foot. People who have their little toe on the side tend to be on the rebellious side and like to have things done their way. They're generally unconventional in their methods. 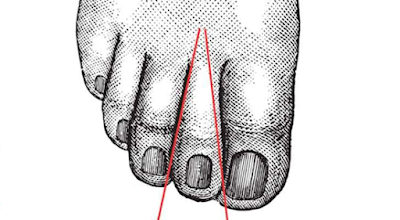 The base of the second toe is narrow (in comparison to the top of the toe), then the person is likely to be expressive. They like to make things bigger than they are, tending to blow things far out of proportion. When this person is in a good mood, they radiate and everyone else can feel the joy. When they are in a bad mood, however, they are best left alone. Also known as the "flame foot," the most distinctive feature for this foot type is the extended second toe (it is larger than the big toe). People with the Greek foot tend to be enthusiastic and motivating. The Greek foot is seen commonly on artists and athletes (representative of people who are creative and sporty), as well as public speakers and innovators. The "Roman foot" is the most common type of foot. The toes are proportionate and they are also all straight, with the big toe being the largest. People with this foot type tend to be very outgoing and sociable. They also tend to be very charismatic, so they make great public speakers and business people. 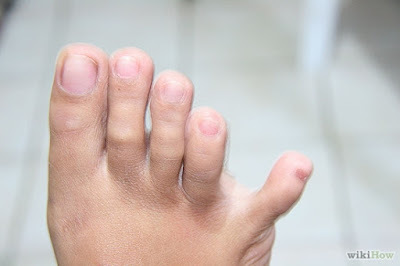 When all toes are nearly identical in length, then the person is said to have a "square foot." Also known as the "peasant foot," this foot type is the most rectangular in appearance. 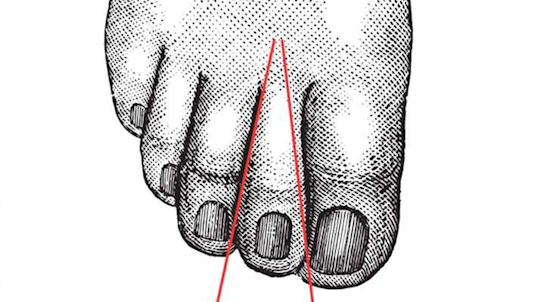 People with this foot type have a tendency to be calm and calculated when making decisions. As a result of this, they are very reliable and practical. These feet have a rather thin appearance. This is due to the fact that the toes are squished together, lending to a lengthier and thinner looking foot. The big toe is generally the largest of all the toes and then the size tapers with each toe. People with this foot type tend to value privacy while also being secretive. On top of this, they can also be impulsive and have sudden mood changes. These people prefer to plan ahead. As a result of they, they are usually very organized and are almost always in control of whatever situation they encounter. People who are unable to separate their little toe tend to prefer routine and structure in order to have a sense of security. They are very reliable and loyal, making them great companions.